Taiwan Military News, Reports, Data, etc. Discussion in 'World Armed Forces' started by Gollevainen, Aug 21, 2007. The new American facility, which will be located just outside of the capital of Taipei, will be able to house 450 people according to the AIT website. The U.S. State Department has approved a significant spare parts support package for Taiwan to support its fleet of military aircraft, marking a departure from the previous practice of approving such sales to the island in smaller packages. According to a Foreign Military Sales notification by the Defense and Security Cooperation Agency to Congress issued Monday, approval has been given to “provide funds for blanket order requisitions, under a Cooperative Logistics Supply Support Arrangement for stock replenishment supply of standard spare parts, and repair/replace of spare parts in support of the F-16, C-130, F-5, Indigenous Defense Fighter (IDF), all other aircraft systems and subsystems, and other related elements of logistics and program support” to the Taipei Economic and Cultural Representative Office in the United States, or TECRO. All DSCA notifications are not final; if cleared by the Senate, procurement quantities and costs can still change in final negotiations. The total estimated program cost is $330 million and is significant, as it marks a return to the practice of such support packages under a single notification and approval for the first time since 2011, when a similar package worth $52 million was approved under the Obama administration. Though not militarily significant, the latest move comes against a backdrop of recent trade tensions and sanctions against Chinese entities for China’s acquisition of Russian weapons. The approval is likely to further inflame relations between the United States and China. This would be the second major arms sale to Taiwan under the Trump administration, and will enable Taiwan to sustain its fleet of Northrop Grumman F-5E/F aircraft, Lockheed Martin F-16A/B fighter jets and C-130 transport planes. The U.S. had previously cleared a package of air-launched missiles, torpedoes and other support equipment worth $1.3 billion to Taiwan in June this year. However, arms sales from the U.S. have slowed under previous administrations, even as China has embarked on a massive military modernization drive, and the military balance across the Taiwan Strait is now almost overwhelmingly in China’s favor. Taiwan has outstanding requirements for a range of military capabilities, including new fighter jets, as its 1970s-era F-5E/Fs are due to be retired soon and its other fighters are about two decades old. China regards the self-governing island of Taiwan as a breakaway province and has not ruled out the use of force to retake it; arms sales to Taiwan usually result in a diplomatic backlash. The United States has no formal relations with Taiwan as part of the “One China” policy, although it has previously provided arms required for “self-defense” to the island under the Taiwan Relations Act. Taiwanese shipbuilder CSBC Corporation has given further details of the landing platform dock (LPD) vessel that it will build for the Republic of China Navy (RoCN). CSBC received a contract for the vessel, which has been ordered to fulfil the RoCN’s amphibious assault requirements, in April 2018. As reported by Jane’s on 27 September, the LPD will have an overall length of 153 m, an overall beam of 23 m, and a hull draught of 6 m. It can attain a maximum speed of 21.5 kt and a range of 12,500 n miles at the economical cruising speed of 13 kt. The vessel will be armed with a 76 mm naval gun in the primary position, and a close-in weapon system (CIWS) turret, and two 12.7 mm machine gun positions in the forward section. 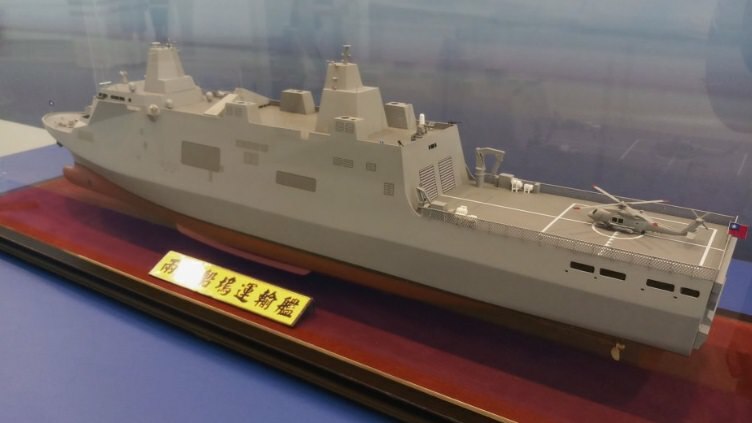 CSBC has since disclosed that the LPD will also be armed with launchers that can deploy the Hsiung Feng II and III family of anti-ship, and land-attack cruise missiles. The vessel will have a crew complement of 190, and carrying capacity for up to 250 marines and 233 fully armed troops. The vessel will also be able to take up to four 16 m mechanised landing craft (LCM) vessels, or up to two 36 m utility landing craft (LCU) vessels in its well dock. The vessel will feature a flight deck that can accommodate one anti-submarine warfare variant of the S-70C helicopter, of which 18 are known to be currently in service with the RoCN. “This configuration will be tested by the navy, and they will give us a feedback. 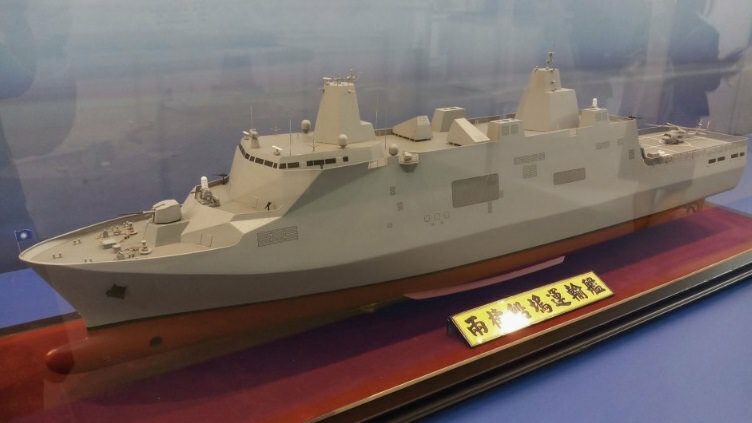 Based on this feedback, we will design the second ship,” the CSBC representative added, confirming plans that Taiwan intends to eventually operate four ships in the class. 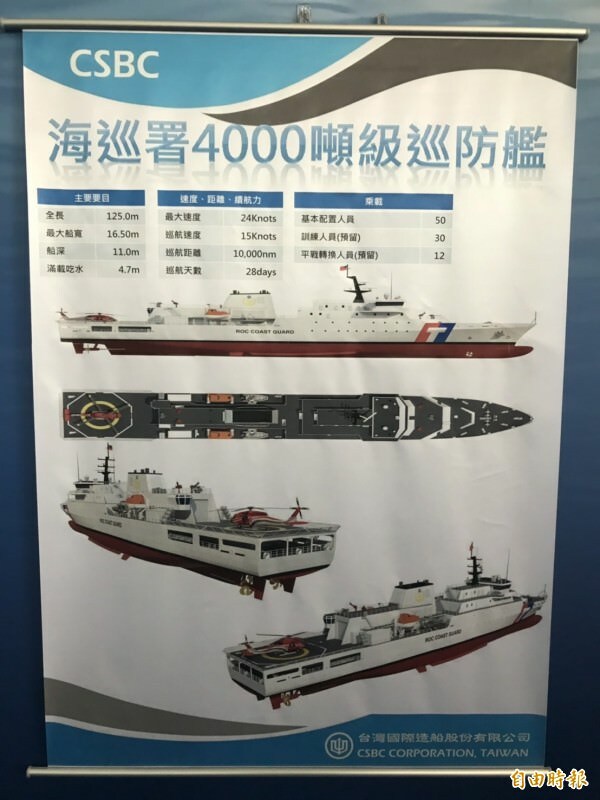 The Republic of China Coast Guard Administration has placed an order for four 125 m vessels with local shipbuilder CSBC Corporation, a representative from the company told Jane’s on 27 September at the Kaohsiung International Maritime and Defence exhibition. A contract for the vessels was signed in July 2018, according to Chung-Kang Hsu, from CSBC’s business development department. “The first vessel is scheduled for launch in January 2020,” he said, adding that the platform has been designed locally. The design has an overall beam of 16.5 m and a design draught of 4.7 m. The vessel will have a top speed of 24 kt and a range of 10,000 n miles at the economic cruising speed of 15 kt. It will have an endurance of 28 days with a complement of 50. The vessel has been designed with weight and strength considerations for two 30 mm remote-controlled weapon stations, one each in the forward and aft sections. It can also embark one medium-lift helicopter on its flight deck, two davit-launched lifeboats, and two rigid-hull inflatable boats (RHIBs). The vessel will also be equipped with four water nozzles, two each in the forward and aft sections, giving it at-sea firefighting and non-lethal confrontation capabilities. Besides accommodation for crew, the vessel has also been designed to embark up to 42 mission-specific personnel. “This could be personnel for scientific research purposes, government officials, or also officials from the navy,” he added. The two have also feuded over Chinese weapons purchases from Russia and China’s territorial claims in the South China Sea — where the U.S. says a Chinese destroyer came aggressively close to a Navy ship late last month, forcing it to maneuver to prevent a collision. I think the F-16 upgrades are long overdue. But Taiwan needs something more than that. I'm not sure if it's worthwhile to spend a lot of money on other air assets though. Like late generation F-15s or the F-35. Regardless of what the Taiwanese do, their airstrips will be highly vulnerable in case of attack. I think they would be better off investing in anti-air missile defenses. Taiwan has taken delivery of its first locally upgraded Lockheed Martin F-16 fighter jet, according to reports in local media. The single-seat aircraft is the first of four Taiwanese Air Force F-16A/B fighters currently being upgraded by state-owned Aerospace Industrial Development Corporation (AIDC) to the F-16V Block 70 standard. The jet was handed over to the Air Force on Friday. The remaining three aircraft are undergoing flight testing at AIDC and are scheduled to be delivered by the end of this year, according to local media reports quoting company officials. The four aircraft were inducted into the AIDC facility at Taichung for upgrades almost two years ago, with sources in Taiwan telling Defense News that unspecified software issues have delayed the upgrade program. However, the delivery of the first aircraft to the Air Force’s 4th Tactical Fighter Wing at Chiayi will pave the way for Taiwan’s remaining 141 F-16s to be upgraded, with plans for AIDC to upgrade 24 aircraft each year under the $5.3 billion Phoenix Rising program. Two other Taiwanese jets have previously been upgraded by Lockheed Martin in the United States. The F-16V upgrade sees the installation of the Northrop Grumman AN/APG-83 Scalable Agile Beam Radar, an active electronically scanned radar, to replace the older mechanically scanned set; new mission computers; improvements to the aircraft’s electronic warfare suite and avionics; and the integration of new precision-guided weapons. In addition to Taiwan, regional F-16 operators Singapore and South Korea are upgrading their respective 60 and 134 aircraft to the F-16V standard, along with Bahrain and Greece. Slovakia is also acquiring 14 new-build F-16Vs from Lockheed. Taiwan is also planning to develop an indigenous sustainment facility to conduct depot-level maintenance and repairs for its F-16 fleet, with the Taipei Times reporting that Taiwan and the U.S. have agreed to prioritize the development of the facility that will allow the island to become self-sufficient in meeting the F-16V fleet’s maintenance needs, as opposed to shipping the jets to the U.S. for major repairs. The newspaper added that the Taiwanese government plans to allocate $50 million in industrial credit from the United States for its use, with another $450 million in credit reserved for construction planning and preparation. The amount will come from the $800 million industrial cooperation credit agreed upon as part of the Taiwanese F-16 upgrade program. 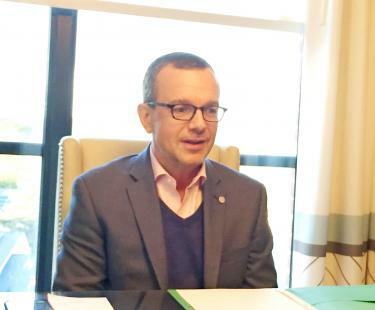 The US should approve another round of arms sales to Taiwan by the end of the year, following a US$330 million deal last month, US-Taiwan Business Council president Rupert Hammond-Chambers said. “It’s reasonable to argue that there will be another congressional notification before the end of this year,” Hammond-Chambers said at a news conference before the opening of the US-Taiwan Defense Industry Conference in Annapolis, Maryland, on Sunday. Prototypes of an armored vehicle developed by Taiwan have passed tests and will soon enter mass production and will form the bulwark of the resistance by ground forces against the Chinese army in the event of an invasion, said an official with the island’s Defense Ministry. Taiwan newspapers reported that four prototypes of the Clouded Leopard eight-wheel armored vehicle series equipped with a 30mm chain gun had passed tests in 62 categories conducted by the ministry’s Armaments Bureau this month. A prototype turret built on this requirement was spotted in May 2015 and unveiled to the public in August 2017. Compared with the army’s existing CM-32 models armed with 40mm automatic grenade launchers, the 30mm cannon offers better anti-tank capabilities and precision firing. Helvey said that by stepping up Beijing's ability to strike with advanced equipment, including long range bombers, the PLA was trying to end the era of zero military conflict that had existed in the Taiwan Strait since 1949, when the mainland’s Communist Party won a civil war that drove the Nationalist government to the island. York W. Chen, the deputy secretary general with Taiwanese President Tsai Ing-wen's National Security Council, told reporters the Taiwanese government would welcome future new arms sales by the US. Taiwan’s navy has commissioned two former US Perry-class guided missile frigates to boost the self-ruled island’s anti-submarine defences, with the island’s president vowing not to back down in the face of growing military threats from Beijing. The two frigates, PFG-1112 Ming Chuan and PFG-1115 Feng Chia, commissioned by President Tsai Ing-wen on Thursday, are equipped with the American-made SQR-19 sonar system, giving them a far superior anti-submarine performance than the navy’s existing eight Chengkung-class frigates built by Taiwan, according to naval officers. The frigates are also equipped with the MK13 guided missile launch system, designed to fire RGM-84 Harpoon Block II missiles as an anti-ship defence – the first such firing system used by any naval vessels and capable of attacking coastal and bayside targets, they said. “Through the commission of Ming Chuan and Feng Chia, we want to send a clear message to the world … that we are not only devoted to strengthening our armaments but are determined to safeguard the Republic of China in Taiwan as well as our free and democratic way of life,” Tsai, commander-in-chief of the Taiwanese forces, said during a commissioning ceremony at the naval port of Zuoying in Kaohsiung, southern Taiwan. Tsai said the commissioning of the two vessels was just another move to uphold the island’s determination to safeguard itself against the mainland’s repeated attempts to weaken the island’s sovereignty and sabotage regional stability and peace. She said the island would make further efforts to boost its defences at a time when the mainland is using not only military threats but also less conventional means such as spreading disinformation and using social media networks to try to attack her government and the island’s industries. Built in the 1980s and named USS Taylor and USS Gary when they were in the US Navy, the highly mobile frigates – equipped with the SQQ-89 undersea warfare combat system – were sold to Taiwan for US$190 million in 2015. According to the Taiwan navy’s chief of staff, Vice-Admiral Lee Chung-hsiao, the ships’ SQR-19 sonar system reduces noise efficiently, enabling more accurate location of enemy submarines. Delivered to Taiwan in May last year, the two vessels, which have gone through weapons fitting and testing in the past year or so, are among the many military purchases it has made from the United States in line with the Taiwan Relations Act, instituted by the US in 1979 to ensure proper defence for the island after Washington switched diplomatic recognition to Beijing from Taipei. Despite repeated protests by the mainland, US-Taiwan military ties have become ever closer as Beijing and Washington have become locked in a series of heated disputes over trade and diplomatic issues including the mainland’s military expansion in the Indo-Pacific region. The American Institute in Taiwan, the US’ de facto embassy, said the US sent representatives to Thursday’s ceremony. It said the frigates’ entry into service would “improve the island’s capability in current and future defensive efforts” as well as “contribute to political stability, military balance and economic progress in the Indo-Pacific region”, in line with US strategy there.